Grab your trailblazer hat and notebook, Salesforce Event Season is just getting started! It seems as if it was just yesterday we were at Dreamforce in San Francisco and now the Boston World Tour is just a few days away! As the leading AI partner for Salesforce, we are so excited to be part of this event. If you haven’t registered, there is still time, here is a quick link to sign up. With that being said, here are the three reasons you won’t want to miss NeuraFlash at Boston World Tour. You won’t find anyone else in the ecosystem that matches our experience and expertise with all things AI and Salesforce. With over a decade of experience, we can help you enhance your Salesforce Solutions with Einstein across industries and clouds. We have a full force of team members on the ground this year ready to provide expert insight into your organization’s pain points. Stop by our booth to see our subject matter experts showcasing how you can leverage AI through demos of Einstein Bots, Service Cloud & Digital Channels, Intelligent Field Service Lightning, and Einstein Next Best Action. At 3:30 pm at Theater 2, Level 2, our very own Field Service Lightning expert, Jason Kitchen, will be sharing how you can optimize your field service operations in only 90 days. Jason will talk through best practices, thought leadership and share learnings from one of the most successful rollouts and fastest time-to-value FSL projects, Samson Rope. Samson Rope is a leading manufacturer and one of the oldest trademarked companies in the USA. You won’t want to miss this one! This is an exciting time for our company; we are growing fast and expect to reach 100 employees by the end of this year. This means we are on the lookout for people with PASSION and GRIT. Passion for artificial intelligence, salesforce, and customer success and the grit for finding innovative solutions for complex problems. Does that sound like you? Our HR Manager will be onsite all day to answer any questions you may have about working with the leading AI partner for Salesforce. Make sure to stop by! 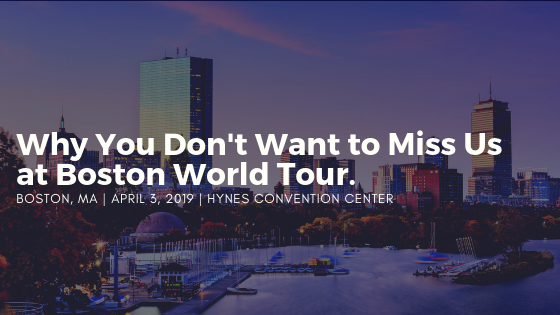 ‍If you won’t be at Boston World Tour see our openings here. See you at the Boston World Tour!